When I was seven, my dad (a teacher) worked with the shop teacher at his school to make me a kitchen playset out of plywood. When I got older, we gave it to my cousin. It was kept in her country carport/basement for many years, getting exposed to many winds and weathers. I forgot about it. A few years ago, it was dropped off at my mom's house when they cleaned up the basement. I'm really glad they did this, instead of just throwing it away. I dragged it out to mom's front yard, and scrubbed it down with soap, water, and a hose. Then I let it dry in the sun, and drove it 5.5 hours back up to my house. Now I have two little girls, and I decided to make it over. My dad had painted it with yellow house painted, rather sloppily I might add. The plywood was a bit soft, and the hardware was all rusted. I sanded it down all over, and changed out the hardware. After a lot of cussing and swearing (and nearly dragging it to the curb several times), it has been primed and repainted. 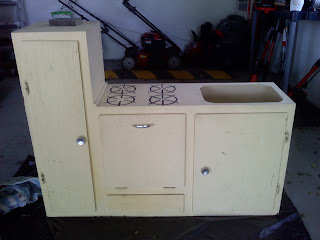 I added some details, like a steel panel for magnets, a stencil, some vintage-looking knobs, and a faux oven door viewing window. I also lined the shelves with polka-dot shelf lining, which I tacked down with a little glue. My older daughter loves it and plays with it every day. (The four-month-old is, as you might imagine, largely indifferent.) For Christmas, I've bought a pink refrigerator to go with the set. I was going to replace the dishpan, too, but I noticed that the date is on the Rubbermaid label: "1981." I kept it to show that she looks pretty good after 29 years!